Basic Disclaimer: The following information is related to SELLING on eBay. It documents my experiences, and some general suggestions. It should not be considered a complete, authoritative, or 100% accurate source of information. You assume full responsibility for everything that happens as a result of your actions. 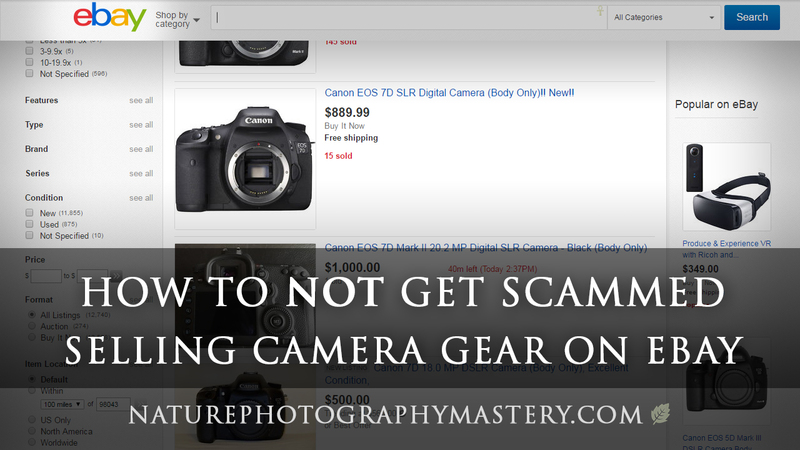 Recently, I was selling camera gear on eBay, and I was targeted by a scammer. Most scammers have the goal of getting you to ship the item to them without them actually paying for it, or to get a refund via a fraudulent claim after the fact. They may also be trying to get access to your personal and financial information, bank account, passwords, address, and so forth. 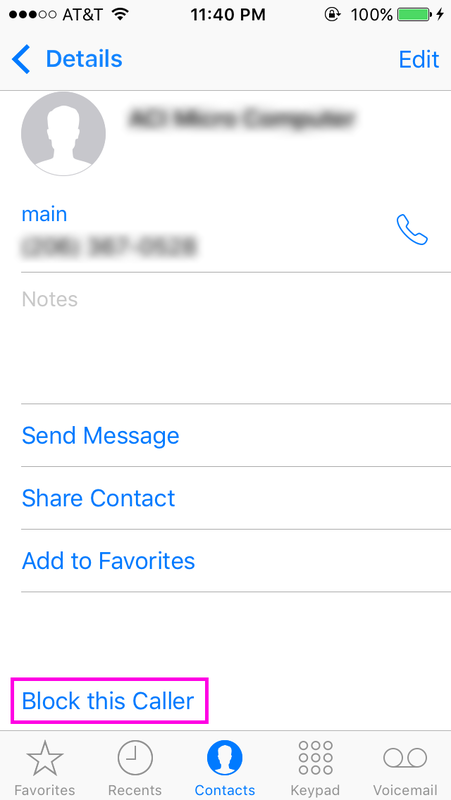 I received an email from eBay saying that the buyer has requested my contact info, and I also saw their contact info. Anthony P, in Maryland, USA. I received a message from the buyer requesting that I send them my PayPal email address or do a PayPal money request to their email address. I became slightly suspicious. 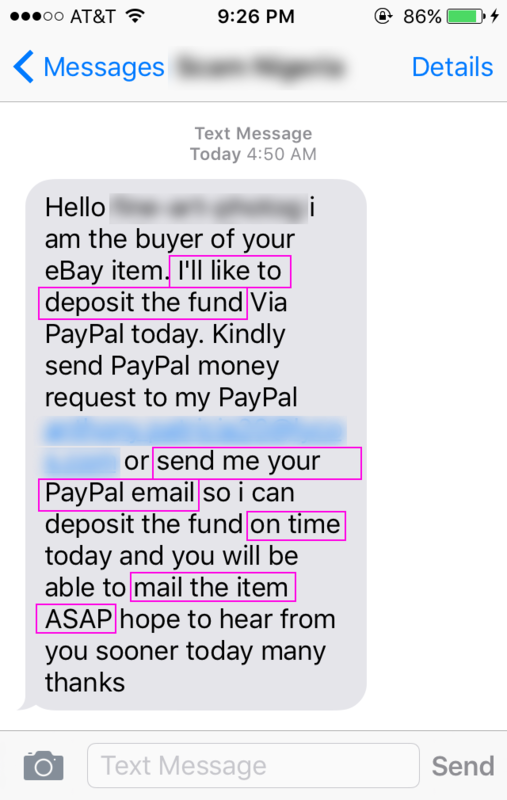 I received another message from the buyer, this time via phone sms text, again requesting that I send them my PayPal email address or do a PayPal money request to their email address. I become even more suspicious. I received an email, which at first glance appeared to be from Paypal, stating that I had received a payment to my PayPal account, but it was pending until I ship the item and supply the tracking number. The amount of the “pending payment” was $750 ($550 + Two HUNDRED dollars shipping). The shipping address was listed as Samuel F, in Nigeria. 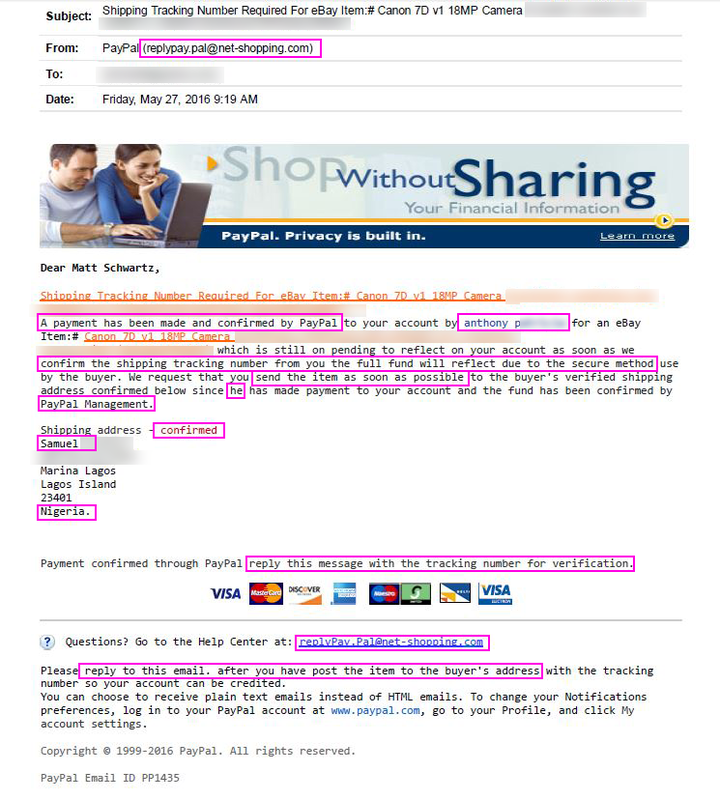 Upon close examination, it was clear that the email was a spoof email from the buyer, not from PayPal. At this point I knew this was a scam. I received another email, which at first glance appeared to be from eBay, again stating that I had received a payment, but it was pending until I ship the item and supply the tracking number. The shipping address was listed again as Samuel F, in Nigeria. Upon close examination, it was clear that the email was a spoof email from the buyer, not from eBay. I typed PayPal.com directly into my web browser (I did NOT click any links in fake emails) and logged into the real PayPal website. There, I confirmed that no payments were received. When I realized I was targeted by a scammer, I took the following steps. 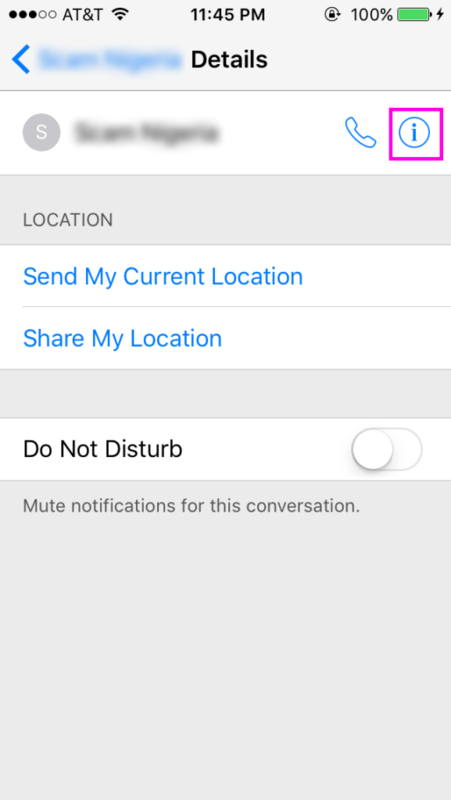 How to block a contact on iPhone. 1. Click the “Site Map” link near the bottom of most eBay pages. 2. In the “Sell” section, click the “Block Bidder/Buyer List” link. 3. 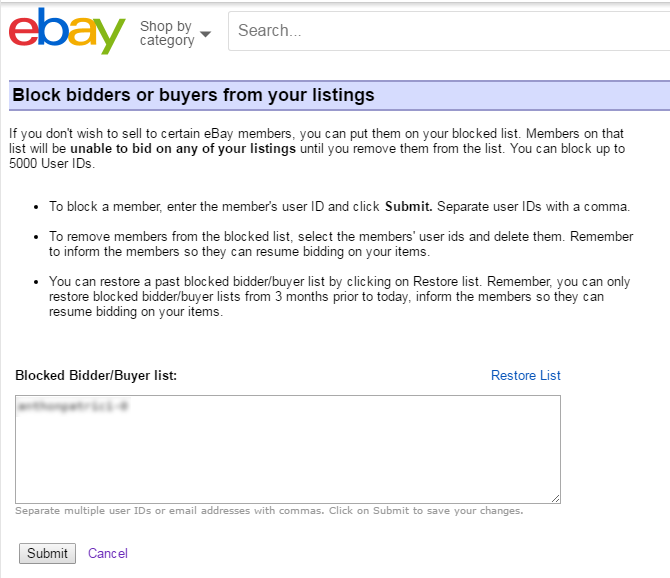 Click the “Add an eBay user to my Blocked Bidder/Buyer List” link. You may need to sign in. 4. Enter the scammer’s username that you want to block, and then click the “Submit” button. Forward the fake emails to spoof@eBay.com and spoof@PayPal.com, respectively. 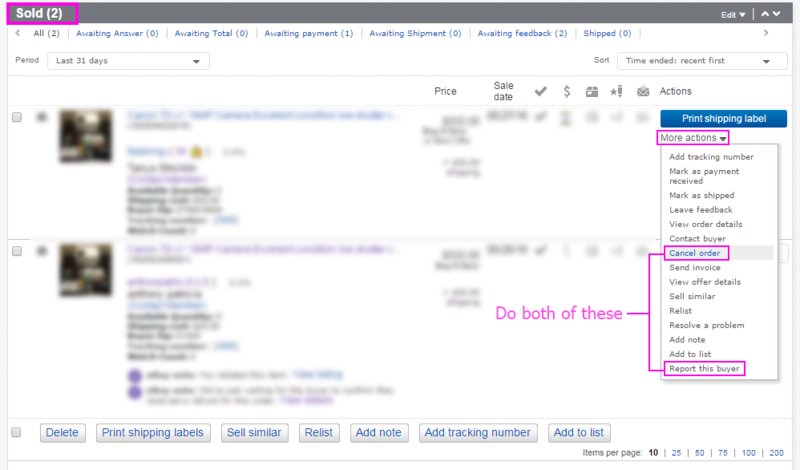 Send the buyer an invoice directly from the item listing in your ‘Sold’ items area (under More Actions). Firmly but politely explain that they can pay via the eBay invoice ‘Pay Now’ button, or eBay website ‘Pay Now’ button on the item listing page or their buyer history page. If they are a scammer, they will not make a real payment (but, if the scammer has access to your email address, you will probably receive fake payment notification emails from the scammer which appear to be from eBay and PayPal). The buyer will be investigated and will receive a negative notation on their account. Explain the issue, tell them what steps you’ve taken, and get confirmation that you won’t be charged any sales fees. Stories from a buyer about how they are out of town, buying this for someone else, need the item shipped to some other address for some reason, need to pay with some other method, and so forth. 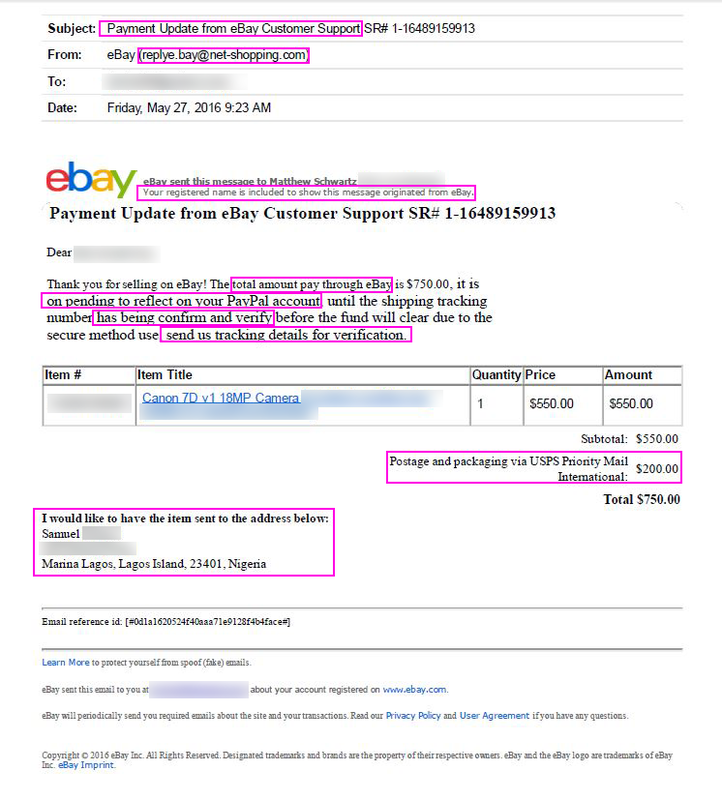 In eBay, the buyer may mark the item as “Payment Sent” even though they have not actually paid. They state that you have received payment, but funds are pending until you ship the item and provide the tracking number. These emails may be poorly written, with broken English, and run on sentences. In your PayPal account and eBay account, I would recommend listing your address as a PO Box or UPS Address, and your phone number as a Google Voice number that you have forward to your main phone. Do not give out personal information of any kind. The buyer should already have everything they need in order to complete the purchase, assuming you have set up your eBay and PayPal settings correctly. Specify very clear item descriptions, information, shipping policies, return policies, and other disclaimers, in your eBay item listings and settings areas. Specifying a “No Returns” and/or “No Refunds” policy may add a little extra protection from scammers who claim the item was damaged upon arrival. Never ship an item until you have actually received payment in PayPal. 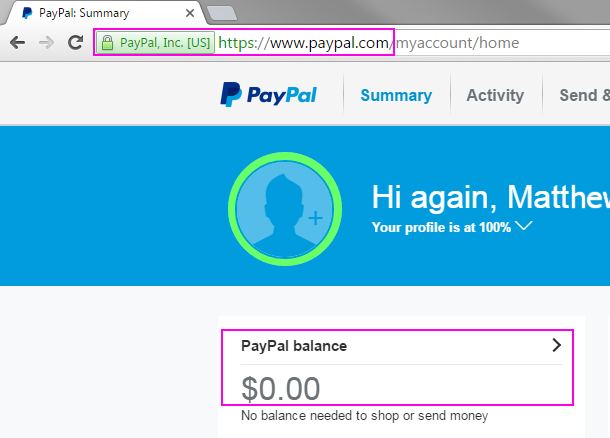 Don’t trust emails – log directly into Paypal.com and look at your account activity. Always get tracking numbers for everything that you ship, so you have a record that the item was in fact delivered. Check out a user’s profile page on eBay. Look at their ratings, comments, registration date, etc to get a feel for what kind of person they might be. This is a general precaution, but everything you see can’t necessarily be trusted, because they may have fake feedback or other fake info. It’s even possible that a scammer has gained unauthorized access to someone else’s eBay account (identity theft). Be extra cautious if a buyer has zero ratings and feedback, and no recent activity. If you suspect you are being targeted by a scammer, contact eBay and PayPal support. If you feel your personal safety is in danger due to any threats or malicious behavior, contact local law enforcement right away. 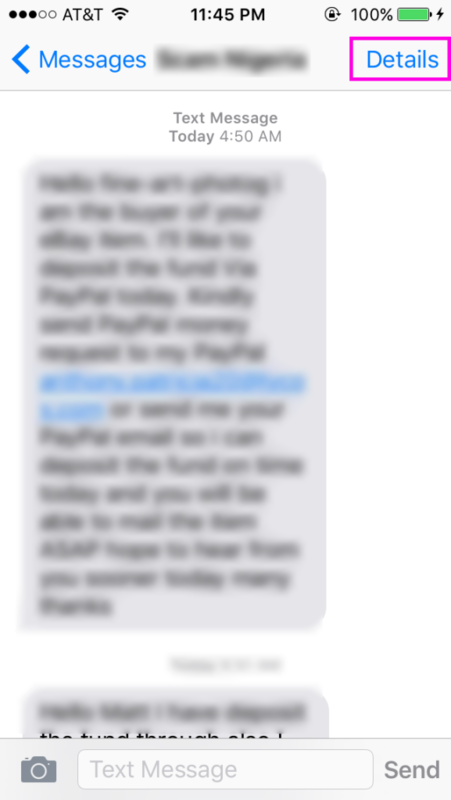 If you suspect you’ve received a spoofed email, forward it to spoof@eBay.com or spoof@PayPal.com, respectively. Never reply to a suspicious email, never click any links in them, and never download any attached files. Watch out for any suspicious activity in your PayPal account, bank account, and eBay accounts, especially after dealing with someone you are suspicious of. 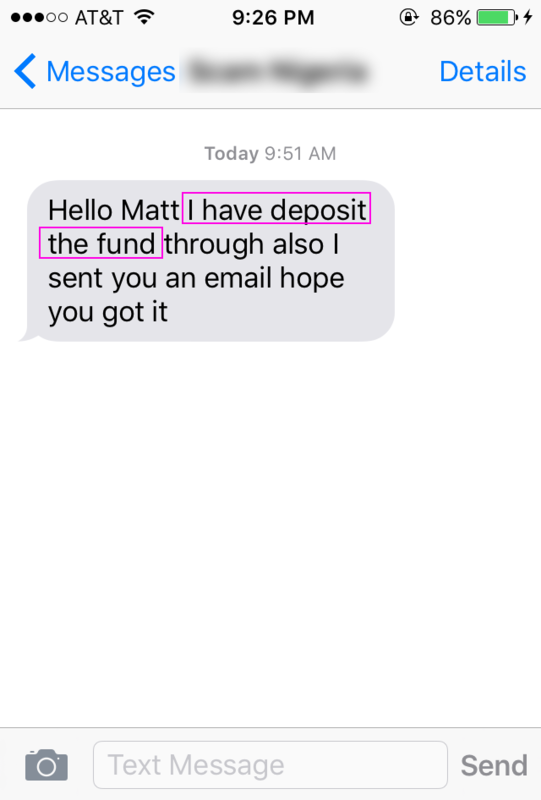 Even if you’re being scammed, be sure that all of your communications toward the scammer are polite, and never call them out as a scammer or make accusations directly toward them. There are two reasons for this. First, you want to keep your eBay account in good standing (by not violating any eBay policies, laws, or appearing to be a “bad” user). Second, you don’t want to aggravate the scammer and have them retaliate toward you; who knows what they are capable of. Keep records of everything. Communicate and interact in writing. Do not make deals outside of eBay. Save all emails and correspondence. If something happens, you will have a better chance of being backed up by eBay, PayPal, and law enforcement.